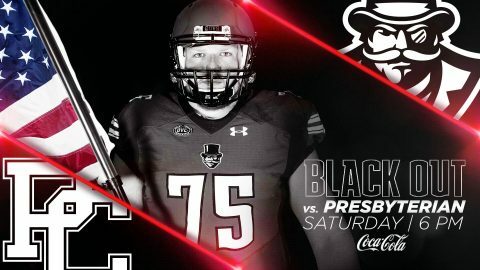 Clarksville, TN – The Austin Peay State University (APSU) football team hosts its home opener, sponsored by Coca-Cola, against Presbyterian 6:00pm, Saturday, September 8th at Fortera Stadium. Saturday’s matchup will be a ‘Black Out’, and fans are encouraged to wear black to the game. The first 1,000 students to Fortera Stadium will receive a free t-shirt. The Governors look to pick up their first win of the young 2018 season after opening the season at FBS No. 3 Georgia last weekend. This will be just the second meeting all-time between Austin Peay and Presbyterian, and the first since Presbyterian won in Clarksville, 13-7, back in 1955. Presbyterian has yet to play a game in 2018, so the matchup against Austin Peay will serve as its season opener. The Blue Hose are replacing a number of their top playmakers offensively in 2018. The Govs will look to get their running game on track against a Blue Hose defensive unit that allowed 254.4 rush yards per game in 2017. Austin Peay hosts its first game of 2018 at Fortera Stadium and will look to win its home opener for the second straight year after defeating Morehead State 69-13 in the 2017 home opener. APSU last won consecutive home openers when it emerged victorious three years in a row from 2009-11. In order, the Governors defeated Newberry (34-23), Cumberland (38-6) and Eastern Kentucky (23-17). Austin Peay is coming off a game in which it played AP No. 3 Georgia in Athens. Georgia is the highest-ranked FBS opponent the Govs have faced in program history. The Governors’ defense buckled down in the second half, allowing only one touchdown to Georgia after halftime. The defensive unit held the Bulldogs scoreless on their final three possessions, and four of the last five. They recovered a Georgia fumble and forced two three-and-outs in that span. Quarterbacks Jeremiah Oatsvall and JaVaughn Craig combined to complete 13-of-21 passes to seven different receivers without throwing an interception. Despite facing an immensely talented defense, the quarterbacks continued a trend of protecting the ball, as they only threw a combined seven interceptions in 12 games a season ago. The Governors played cleaner football to open 2018, accruing only three penalties for 15 yards against Georgia. In 2017, they averaged 8.4 penalties for 74.6 yards per game. After one week of play, the Govs rank 3rd in the NCAA in penalty yards per game and 5th in penalties. Punter Devin Stuart tied a career high with eight punts against Georgia, averaging 40.0 yards per boot, with a long of 51 yards. Four punts were not returned, and of the four that were, the Bulldogs managed only 14 yards, for an average of 3.5 yards per return. 0 – The offensive line looked stout in pass protection against Georgia, allowing zero sacks against a Bulldogs defense that recorded 34 sacks last season. The unit only allowed 10 sacks in 12 games in 2017. 92,746 – The Govs should be prepared to play in any environment after playing in front of 92,746 people at Sanford Stadium. It is the second-largest crowd APSU has played in front of, trailing only the 97,169 at Tennessee in 2013. 8 – The Govs again shared the wealth in the ground game, as eight players had at least one rush attempt. The FCS’ sixth-ranked rushing attack last season totaled 3,105 yards with no player eclipsing 700 yards. 1 – The Govs’ defense forced its first turnover of the year, when defensive end Shaun Whittinghill pounced on a loose ball on a mishandled exchange as Georgia approached the red zone toward the end of the third quarter. Be sure to follow all the Austin Peay football action at LetsGoPeay.com and the official Facebook page of Austin Peay Athletics. In addition, live play-by-play coverage can be found on Twitter (@AustinPeayFB) and PeayStats.com. Live coverage from this weekend will be provided via streaming (ESPN+) .